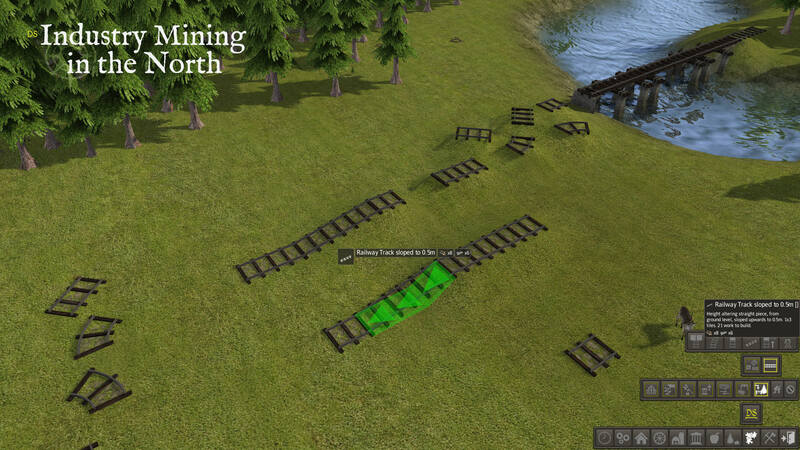 The raised to 0.5m Railway Tracks are positioned centre of a single tile, but will raise/alter the terrain around it approx. a tile on each side. 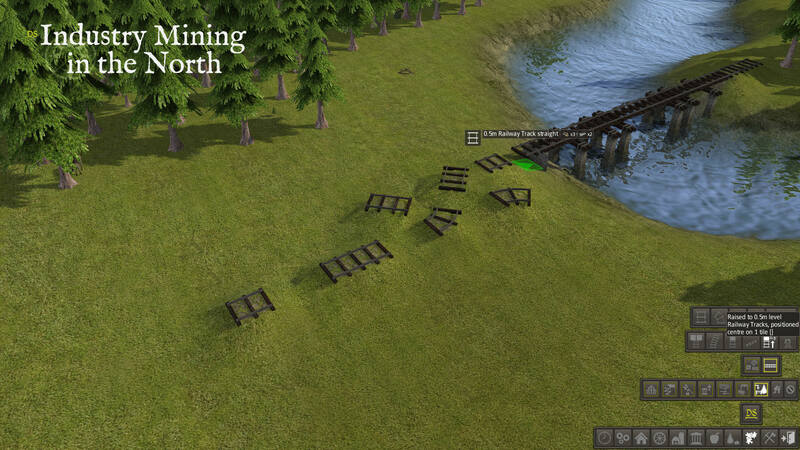 also: there is a transition piece – a 1×3 sloped piece that changes railway from a single tile ground to raised 0.5m. 0.5m Railway Track straight – straight piece, 1×1 tiles. 8 work to build & 3 wood + 2 iron. 0.5m Railway Track half left turn – left turning piece, turns 45degrees, 1×1 tiles. 8 work to build & 3 wood + 2 iron. 0.5m Railway Track half right turn – right turning piece, turns 45degrees, 1×1 tiles. 8 work to build & 3 wood + 2 iron. 0.5m Railway Track angled – angled piece, 1×1 tiles. 8 work to build & 3 wood + 2 iron. 0.5 Railway Bridge – from shoreline to shoreline, the bridge is built at a raised height of 0.5m. 3 work to build & 2 wood + 2 iron + 1 stone per tile. Allows citizen travel like normal bridge. Railway Track sloped to 0.5m – Height altering straight piece, from ground level, sloped upwards to 0.5m. 1×3 tiles. 21 work & 8 wood + 6 iron to build.